I grew up in the fifties, a time when home-cooked meals were first being challenged by TV Dinners. TV Dinner is a genericized trademark originally used for a brand of packaged meal developed in 1953 by C.A. Swanson & Sons (the full name was TV Brand Frozen Dinner). 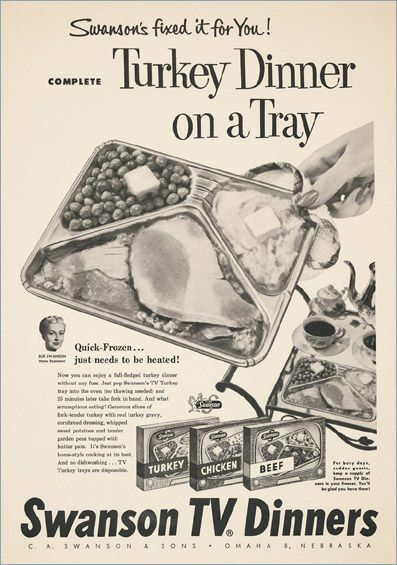 The original TV Dinner came in an aluminum tray and was heated in an oven. The first Swanson-brand TV Dinner was produced in the United States and consisted of a Thanksgiving meal of turkey, cornbread dressing, frozen peas and sweet potatoes packaged in a tray like those used at the time for airline food service. The identity of the TV Dinner's inventor has been disputed. In one account, first publicized in 1996, retired Swanson executive Gerry Thomas said he conceived the idea after the company found itself with a huge surplus of frozen turkeys because of poor Thanksgiving sales. Thomas' version of events has been challenged by the Los Angeles Times, members of the Swanson family and former Swanson employees. They credit the Swanson brothers with the invention. Either way, Swanson's concept was not original. In 1944, William L. Maxson's frozen dinners were being served on airplanes. Other prepackaged meals were also marketed before Swanson's TV Dinner. In 1948, plain frozen fruits and vegetables were joined by what were then called 'dinner plates' with a main course, potato, and vegetable. Later, in 1952, the first frozen dinners on oven-ready aluminum trays were introduced by Quaker States Foods under the One-Eye Eskimo label. Quaker States Foods was joined by other companies including Frigi-Dinner, which offered such fare as beef stew with corn and peas,veal goulash with peas and potatoes, and chicken Chow Mein with egg rolls and fried rice. Have a look at the old newspapers from April 6, 1954 and get them!